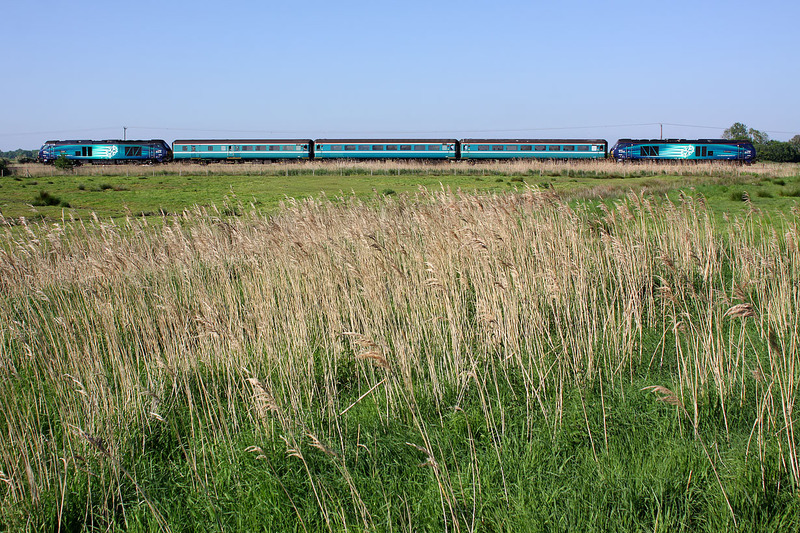 The 2P28 16:38 Norwich to Great Yarmouth Greater Anglia service crosses Tunstall Marshes, near Stracey Arms on 26 May 2017. 68022 Resolution (right) leads, and 68003 Astute (left) brings up the rear. As the conventional viewpoint would be very backlit, I opted for this side view, which would also include a large patch of the reads, that are so typical of the Norfolk area. Unfortunately, I had no accurate way of judging if I had left a large enough gap for the train. As this is the full frame, you can see that I only just got it right!